This album has been on repeat for over a month now. I knew I wanted to review it, I knew I loved it, but I was unsure how I could put into words what I was feeling while listening to it. Honestly, I was taken by surprise due to my unfortunate lack of taste with female vocalists. Why I struggle, I will never understand. I realize the irony behind being a female, loving hard rock and metal, and my ears not fully appreciating the incredibly talented female vocalists out there. I don’t doubt the talent behind these women, and I am proud to be a part of their gender, but unfortunately, it is just not something I have been able to love like I feel I should. I loved Joan Jett and Stevie Nicks while growing up, and those two will always be at the top of my female vocalists list, and thankfully another one just was added, Holy Grove‘s Andrea Vidal. Instrumentally, the band’s latest album II is an incredibly composed and solid album, and Vidal adds beautifully to this. Holy Grove is based out of Portland, Oregon. The quartet originated in 2012, and includes band members; Andrea Vidal (vocals), Trent Jacobs (guitar), Gregg Emley (bass), and Eben Travis (drums). II is, you guessed it, their second album. Their self-titled debut was released in 2016 after four years of touring. They have paved a path and made a name for themselves over these six years of their activity. It is no wonder as to why, just listen to them and you will understand. This album starts off with an incredible musical platform, remarkable riffs, and steady drum beats. Track one, “Blade Born”, showcases how insane Vidal’s vocals are, from the beginning and throughout the song. It has an epic doom metal feel to it, yet also almost a classic rock break, where Jacobs kills a guitar solo in the middle of the song. This is followed by an unbelievable breakdown that is sure to have you banging your head. Plenty of groove and dank riffage to begin our journey. “Aurora” is the shortest track on the album, and it will have you asking for more cow bell. The guitar riff at the beginning of this song is catchy and has almost a 70’s rock feel to it. Sort of a serpentine swagger. Vidal’s vocals are gritty and fit the song perfectly. You will hear the extreme diversity of her vocals from track one to track two. She is a powerhouse. Another incredible solo breaks out at the end of this song, it is short, but impressive. You cannot have stoner doom without some Sabbath vibes in the mix, and Holy Grove delivers in that vein with the weighty opening to “Valley of the Mystics”. The first 90 seconds is pure beastly instrumental and beautiful stoner rock. Once Vidal starts singing, your heart might dive a bit. Her sorrowful voice made me feel like I was stuck in the darkness, but I did not feel alone. Almost as if going into a battle and training for it. As you get to the peak of the song, it takes a dramatic turn to a soft and awe-inspiring event, before it dives right back into the heaviness of going into the battle. If I was suggesting music for a Lord of the Rings type movie, this would be my montage song. Track four, “Solaris” has another implausible doom metal feel. It is a bit slower, but just as dynamic. This song goes through many changes throughout but maintains an incredible composition. The instruments all complement each other and rise and fall as they should. Six-and-a-half minutes in enters a soulful guitar sound that made me close my eyes. It was as if the ocean was calling me back home, or a siren’s song to get lost in the depths of her torment. The album’s final track, “Cosmos”, starts with a perfect bass riff from the talented Emley. Sometimes the bass is lost in music, I love when it stands alone. This is a great depiction of that. Slowly the guitar enters, then the cymbals from the incredible Travis. It all comes together majestically. This song is almost meditative. It is slow and steady and breathtaking. Forceful and persuasive, “Cosmos” quickly became my favorite song on the album. There is dominant guitar work, soulful vocals, compelling drum beats, and influential bass harmonies. Cleverly titled, because I would not steer from this song while gazing up at the cosmos. This is an excellent end to a classic album. Holy Grove has a way of telling amazing stories musically. This album is five songs deep but feels much larger. There is a presence you feel while listening to Holy Grove that is difficult to explain. Vidal’s plaintive vocals combined with the moody instrumentation create a feeling of being alone, yet knowing you are not. 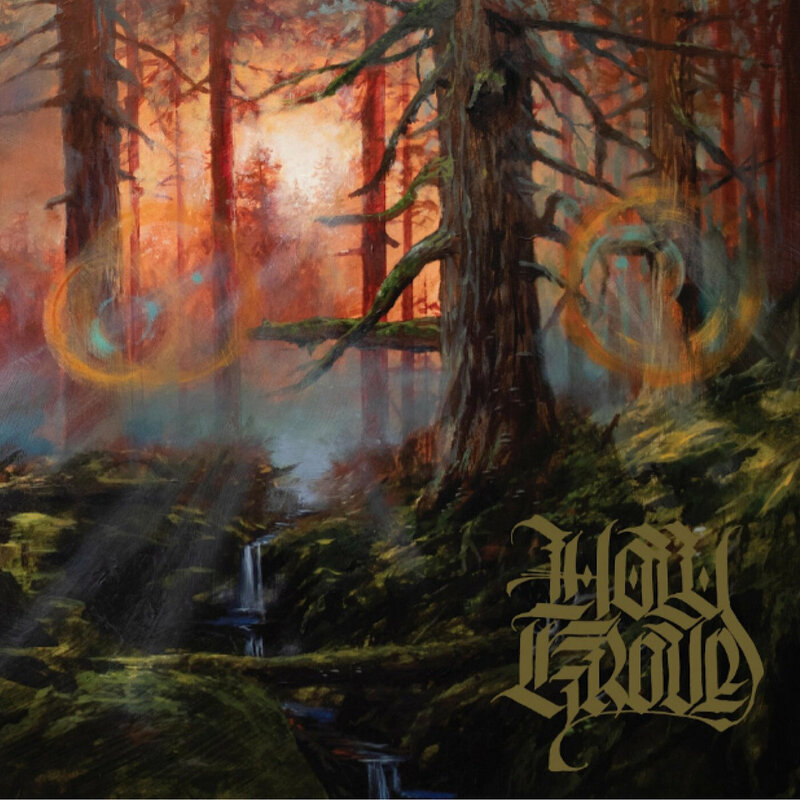 With II, Holy Grove demonstrates its songwriting ambition and growth, pushing beyond it’s humble and bluesy beginnings into something more monolithic and imposing. The record exudes greater confidence than its predecessor and resonates with a more instinctive attitude of dark grandeur. This is a must have for any doom metal enthusiast. It is a flawless and sublime album.